Image rendered at request. Comes with httpserver. Choose heading, fontsizes, fontface, colors. Built for for the nxthacks voting, and beyond. Placed under my giveback license v05. Please give generously. Thx. A Blockchain aware countdown timer ! v10 Fonts & Static pages - detected automatically. You choose your own fonts! And *tattaa* the first donation came in! Thx! * I started this session (the 3rd after waking up 26 hours ago) in a MINDMAP software.
" It works! This is awesome. Tomorrow, i will make it work for ethereum. " I have won the nxthacks2015 - the voting poll of which was the inspiration for this chaincountdown. * instructions how to install it. ... in the LIVE VERSION of this neat and useful image server. If you like this, show it: NXT-CMKU-ZQYK-V6CD-9UHF4 - thanks. EDITED heavily, to avoid repetition below. See this post for the continuation of this. 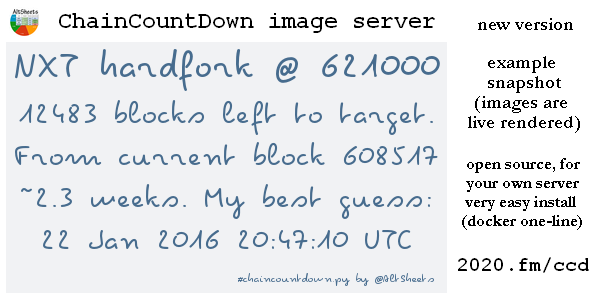 Motivation, why all this --> A user had complained that my image server 'ChainCountDown' was broken ... but it actually was jxnt.org which was down - which is the server I had been using for API queries (of 'getBlockchainStatus' --> blockNumber). New solution: Whenever an API lookup is failing, the next server is asked. Only if all nodes are failing, my server is in trouble. But now server names are hardcoded in config.py - so I wanted to select servers which may last a while. Choosing by looking at their domain names. PeerExplorer for HZ - updated! * and see the network analysis results below. ... I could use www.peerexplorer.com results, so the main work was a multi-threaded DNS lookup. * The domain names are sorted back to front, with TLD as the most significant split part. * The IP addresses are in increasing order, with most significant the left-most byte. These are all IPs with open API! (3) in each thread ... dequeue one AP, add it to 'apDone'. (4) if an IP answers to a 'getTime' query on 7776, save it to 'openAPI'. (5) if AP is answering on peer node port (usually 7774) to 'getInfo', then query 'getPeers' - then enqueue all its (yet-unvisited) peers. 63 with open API (answering on port 7776). Of 63 nodes with open API, 44 had a domain name. To see all details, scroll down in this output file peerMagic_HZ.txt. BUT that way, I could NOT find 85.214.65.220 which is api.nhzcrypto.org. So ... something in my strategy is not perfect yet. I might not be finding all nodes! MaWo's script helped ... and after a lot of fiddling, I found the way. Yiehah. Now ChainCountDown is more resilient, because instead of 1 server per coin, I hardcoded 6 and 7 addresses with open API. That should do the trick. 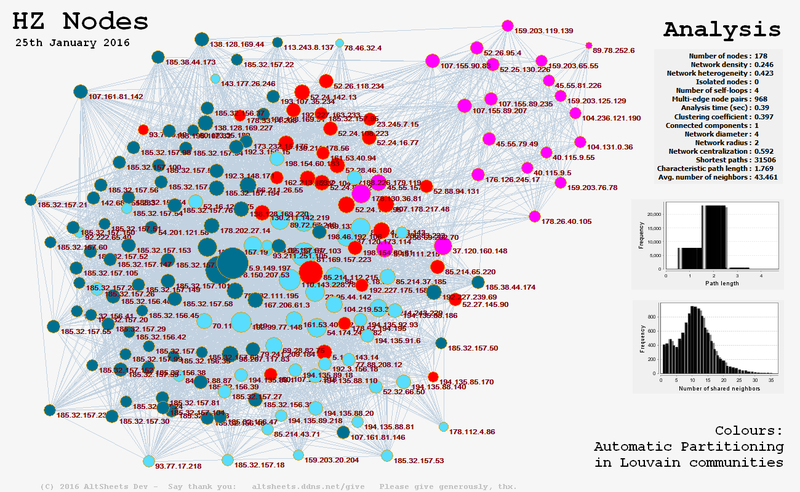 Once the above crawler was ready, a natural next step was to make a network graph from the collected data. Two nodes (green spheres) are connected with edges (gray lines) if they call each other 'peers'. The more peers a node has (that is called the degree of a node), the bigger its sphere. The network is very dense, so most nodes end up drawn into one big ball. But those which are not, were catching my attention. Irregularities are interesting. "Path length" means how many steps a transaction needs from one node to another one. and "characteristic path length" that on average only 1.769 steps. The "Number of shared neighbors" is interesting. Many nodes are almost copies to each other. 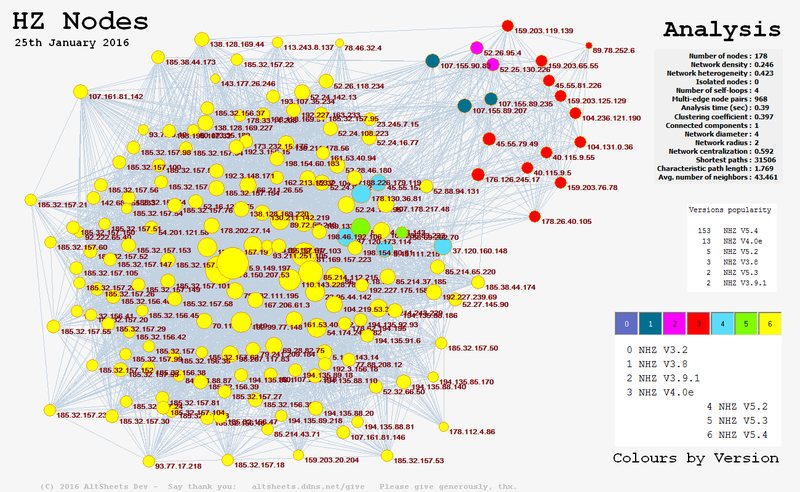 The mainstream (yellow) nodes do not like nostalgic, old-fashioned nodes - and do not connect to them. 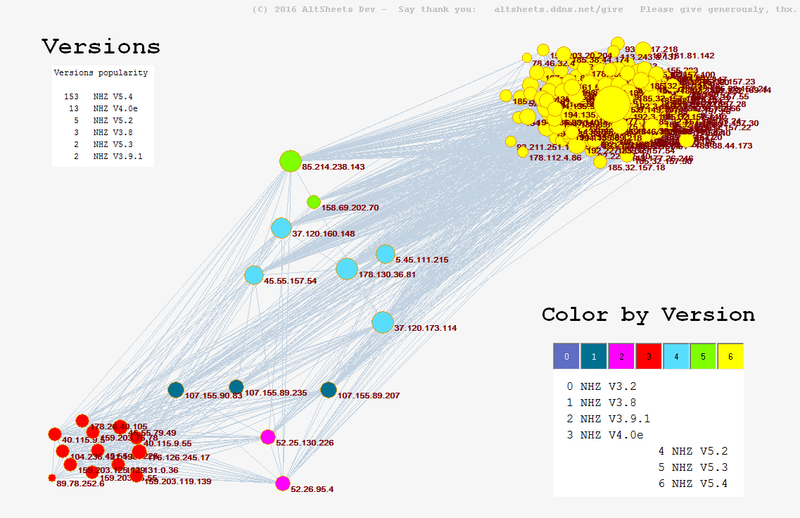 The three V5 versions are mixing well, the network graph is showing that too. The placement of the nodes is a bit artificial, it uses a "optimize inside clusters only" layouting. But it gives immediate feedback that coloring ("NHZ versions") has something to do with graph structure. 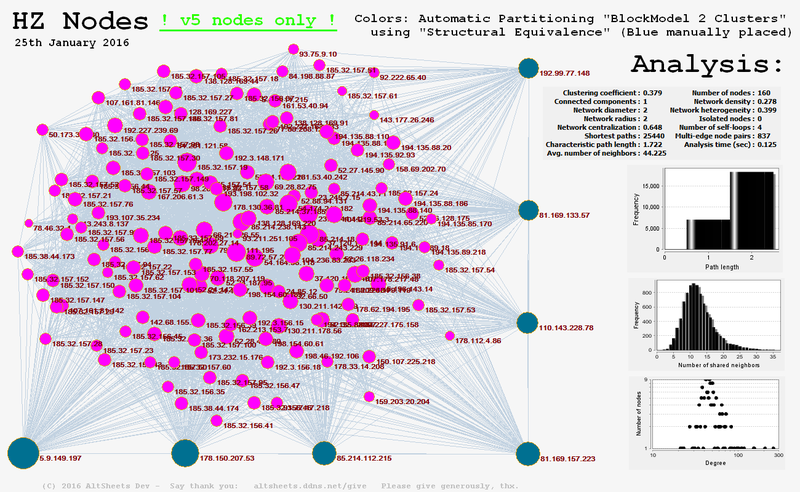 The "NHZ 4.0e" version still has a lot of fans (RED nodes). it is very difficult to get a meaningful automatic layout. What I employed is the automatic partitioning "BlockModelling" by "Structural Equivalence"
... which identified 7 nodes (blue) to be different from all the other >150 ones. They also seem to be the ones with the largest degree. I placed them manually. At the bottom right you see a (log-log) histogram of degree versus number-of-such-nodes. * ... against random failure: How many nodes have to fail until the network is fragmenting. * ... against attacks: How many of the most connected nodes have to fail, until the network is fragmenting. user question "your image server is down" ... evolved into a whole research project. - then please now consider a way to give back. Thanks. You're good.